Perhaps greatest among these options are the many Chicago farmers markets. These markets bring more than 70 vendors selling fruits, vegetables, plants, flowers, and canned and baked goods to sites across the city. Most markets take place once a week, but several, including the Green City Market, are open more often. As a Realtor, I am out on appointments seven days a week. Whenever possible, I try to swing by a farmer’s market between appointments. Just last Saturday, I squeezed in enough time to purchase an armful of corn on the cob as well as Michigan fruit and the ingredients for ratatouille. Saturday night, I cooked and organized and we have been enjoying the fruits of my labor (no pun intended) ever since. 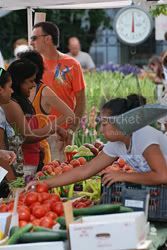 For the epitome of local flavor, the City Farm sells produce grown right in the city on a garden lot at 1204 N. Clybourn. Its crops are often used by local restaurants including the Ritz-Carlton Dining Room. Of course, the farmers markets are only a seasonal occurrence, which is where storefront markets come in. There are many organic grocers in the city, foremost among which is the Whole Foods Market chain. A portion of their selection is local (defined as shipped from no more than seven hours away), but by definition, out of season products and those that simply won’t grow in Chicago (bananas and pineapples come to mind) arrive from elsewhere. In addition to their six Chicago locations, Whole Foods hosts organic and sustainable cooking classes offsite including two upcoming classes at the Lincoln Park Zoo Farm House this month. Chicago is home to numerous organic grocers including Newleaf Natural Grocery and True Nature Foods, as well as countless organic juice bars and green-minded restaurants. Sola Restaurant is hosting an organic five-course dining event, their First Annual Green Harvest Dinner, at 6:30 pm on August 11th. Of course, if you’d rather cut out the middleman altogether, you can look into planting your own backyard garden, joining a neighborhood garden, or growing produce on a terrace or in a planter box. The appeal of green food may be coasting on a bit of extra hype these days, but with real benefits in health and taste, it’s not something to dismiss lightly. Plus, if the experience of buying, growing, and cooking green can enrich the lives of you and your family, who can say “no”? To find the major farmers markets and organic grocers on the North Side, consult the map below. 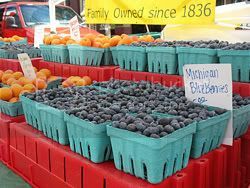 Green markers denote farmers markets and blue ones denote organic grocers. Click the markers to view locations and dates. The Market is abuzz as neighbors meet and greet while they eat and shop. Come out for delicious fruits, cheeses, produce, meats, crepes (made while you wait! ), pastries, eggs and flowers, Blaine School’s local coffee blend, cookbooks, and more. Local artists offer great gift ideas. Bring the kids! No need to eat breakfast before you come. See you for breakfast at the Market. Mark your calendars. The Southport Green Market is every Saturday through October 18th.